Diouana speaks and understands French just fine, but her snobbish employers treat her like she’s a deaf, dumb, and blind mute, even in front of guests. Recognized as the first Sub-Saharan African film to receive international acclaim, Ousmane Sembene’s Black Girl is a movie that has, since its release, been shown in film classes and been featured in global cinema documentaries the world over. Its writer-director, Sembene, is also referred to as the “father of African cinema,” so if you’re looking for a starting point to explore the most culturally significant films from the continent, you’d be hard-pressed to find a more logical origin than Sembene’s debut. Much like Sembene’s other seminal works (e.g. Xala ) and those by fellow Senegalese director, Djibril Diop Mambety (e.g. Touki Bouki ), it’s a heavily metaphorical work that focuses on pertinent (both then and now) themes of developing African nations, such as European cultural imperialism and post-colonial identity. Its nuanced, critical analysis of former 3rd world culture following the withdrawal of European empires makes it a key part of the 3rd Cinema movement, further popularizing the scrappy, low-budget, authentic filmmaking styles used by Italian neorealist authors in the 1950’s and 60’s. Black Girl is a trimmed, toned film at barely 65 minutes in length, but packs a healthy dose of thematic content and character development over its short running time. 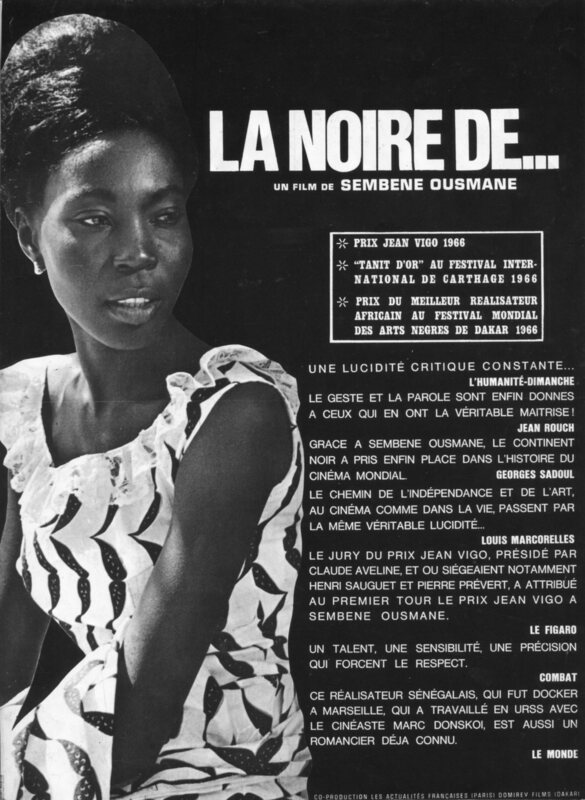 Diouana, the titular black girl (or as the original French title, La Noir de… implies, “someone’s” black girl) is a similar figure to the protagonist in Mambety’s Touki Bouki released several years later: A young, restless adolescent who dreams of leaving her familiar, unexciting life in Dakar, Senegal for the alluring bourgeois lifestyles of France. Eventually, our protagonist’s despair leads to a resonant conclusion; the film’s epilogue, where her former employer tries to pay her mother the rest of her paycheck back in Senegal, has become arguably the most referenced scene in African cinema. Sembene’s clever composition of tracking shots and haunting use of an African tribal mask highlights a social dilemma that no amount of poignant dialogue could ever address. The final shot of the superb ending. The fact that Sembene was learning to make feature-length films as he made this one limits the appeal of some of his sequences. His use of voiceovers is ineffective and repetitive given how the viewer can read all the information that’s spoken in the frames themselves, as well as the actions of the characters. Given the film’s chump budget, the general look of the film suffers, particularly in the drab Antibes apartment (although one could argue that was intentional). If you had to pick only one Sub-Saharan African movie to watch in your life, I’d recommend watching this one if nothing else than for its influence and memorable final shots. The concluding scene has been paid homage to many times inside and out of African film, and it represents the beginning of a high-point for Senegalese cinema from which a movie-making culture could flourish within the Dark Continent. Black Girl is humble in appearance and is no glowing masterpiece of sociopolitical analysis, but for its part, it knows its subject matter well, and teaches an interesting lesson through classic film imagery and tone. SUMMARY & RECOMMENDATION: Symbolically and thematically rich like most 3rd cinema features, Black Girl wastes little time delivering its message in effective, efficient manner. Sembene may have been a rookie, but with his first film he was already adept at using mise-en-scene features like blocking, props, and location-shooting to build his cinematic imagery. — However… the film’s budget (or lack thereof, rather) makes this story’s visual style unappealing at best and downright cheap at worst; the protagonist’s narration is unnecessary and distracting.
? An emotionally unstable mom, a disinterested, aloof dad — who’s willing to bet that kid Diouana was babysitting is gonna have problems when he grows up?